Pretty enough for trendy interiors, yet durable enough to weather the elements, this swivel lounge chair rises to the challenge beautifully. 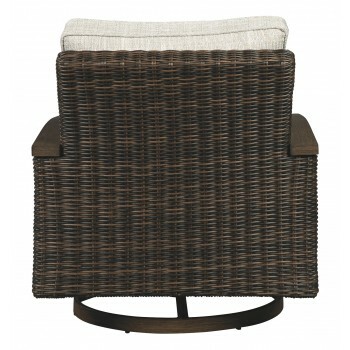 Handwoven resin wicker over rust-proof aluminum merges high style with low maintenance. Rest assured, though the exposed armrests and swivel base look remarkably like wood, their sturdy aluminum construction is perfectly suited for al fresco living. Plush seat cushions wrapped in high-performing Nuvella® fabric aim to please.